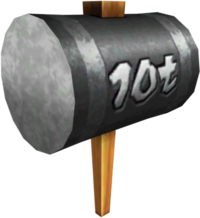 The 10T Hammer is one of Donkey Kong's special items in Mario Kart Arcade GP, Mario Kart Arcade GP 2, and Mario Kart Arcade GP DX. The 10T Hammer is a battering item, much like the Thunder Stick. Upon using the 10T Hammer, the user will proceed to swing it around for about 5 seconds, dealing damage to any other racers who draw near. The 10T Hammer is featured in the challenge game of the DK Cup. In the challenge game, the player must use a 10T Hammer to knock down 15 Koopa Troopas in DK Jungle. As any character can participate in the challenge game, this makes the 10T Hammer the only special item that can be used by characters it does not normally belong to. This page was last edited on February 26, 2019, at 01:29.